This month my ORTS jar is posing with a nice Spring page from my scrapbook. The paper has geometric butterflies on it, I've added some daffodil embellishments and some floral ribbon. The two designs are Lizzie*Kate's Spring and The Snowflower Diaries Tulip and Bunny. 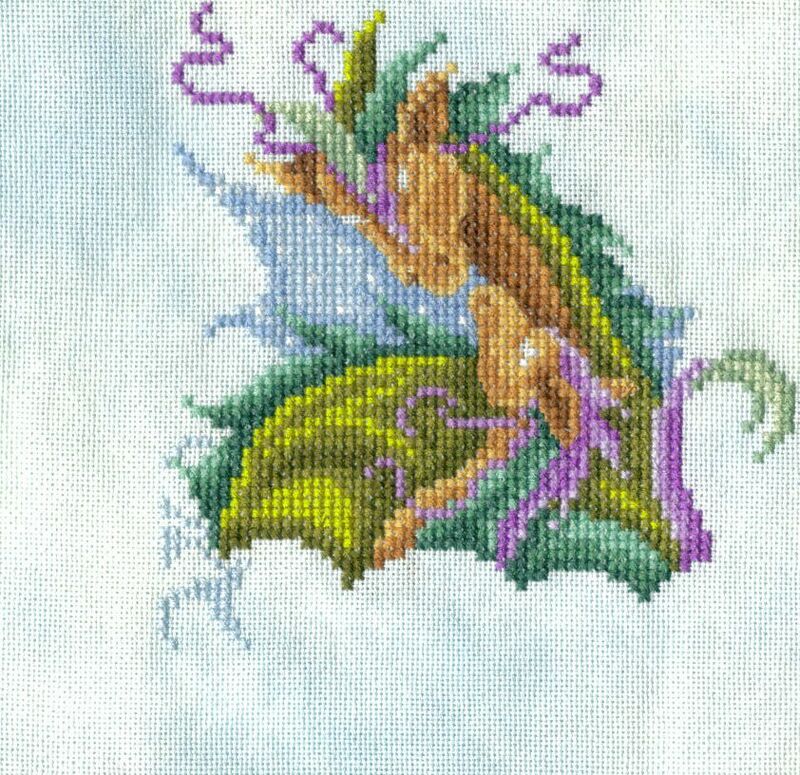 Both stitched over 1 on 28 count yellow evenweave. Here is my current evening piece. I'm really enjoying being a OAAT on this and don't want to put her down! 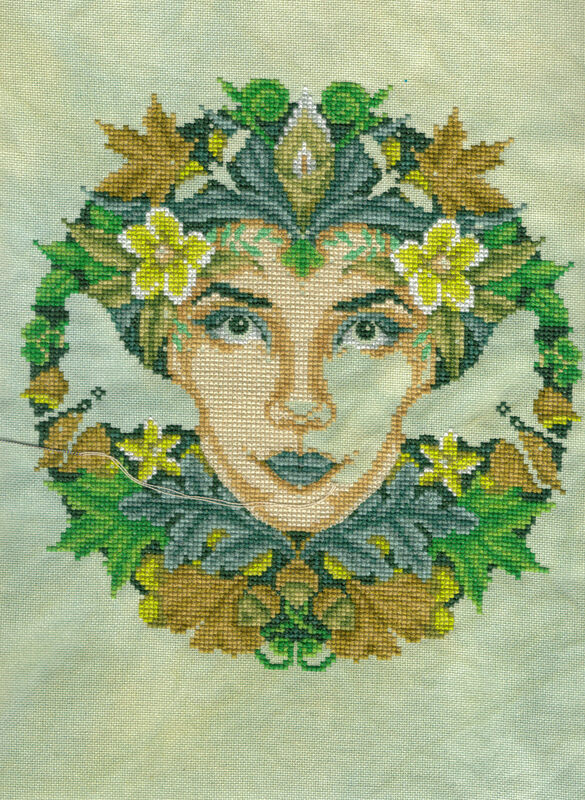 I've stitched half the fill-in on her face and intend to finish the other side then move onto the large Mirabilia Round Robin. I have a Mermaid on that one. Although I have until July to stitch her I don't want to be Ms Last Minute dot com! These are the first two hearts for the Thread Pickers SAL on FB. The first heart was charted as a solid heart to show off each person's variegated thread but I didn't feel like stitched an expanse of plain xxxs so I charted our initials in a heart shape (mine, hubby's and the boys'). The thread is a De Haviland imitation silk in rainbow colours. I'm stitching on white 32 count but having seen some of the others I'm thinking black would have looked amazing! Finally, this is a picture a friend sent me. This was invented by her and her partner as an eco and cost-effective way of helping the elderly keep warm. But what does this picture scream at you? Hands up who said "stitching booth"? Because that was my first thought! This idea is only in the development stages, they have a patent (so don't try copy it LOL) but need feedback to see if people would actually buy one. I can just see me having all my supplies hung on little hooks inside the booth and shelves on the outside or maybe pockets for fabric? Any comments left about the booth will be passed onto my friend. I'm not charging her for market research but maybe she'll let me be a guinea pig for one?!! The variegated hearts look fab. All of your stitching is fabulous and I love the ort jar. I think a stitching booth is a good idea, you could put in an Ott light overhead and attach a stitching frame holder instead to the tray. That's a great idea for a chair. Love all your stitching. Great idea, well done to your friend. What about some extra lighting inside for those who like to read on stitch/craft as I could see the sides blocking out some light. Great idea about the variegated heart to add your initials, it's super. all it needs is a little footstool like shape to rest the feet on, and definitely agree to light. Great stitching. Love the booth! Great stitching. I think if I had a chair like that my family would laugh and shaken their heads. I would add light, a stand/frame on one side and a tray for putting my scissors etc on when working. Oh and a drawer in the base of the chair to ensure that your stitching could be tidy when not being worked on. Another thought make the chair a recliner.Can you tell I got carried away LOL. Looks so great, thank you very much for choosing my design! :-) I really like your blog, I follow you from now on! Happy stitching, dear, greetings from Hungary!